Another amazing dish that I loved eating while growing up is potato stew. It requires one big pot and only 45 minutes. Delicious leftovers last in the fridge up to 3 days and are easy to warm up. Since I already shared with you a few stories about my husband and I visiting Romania (Chicken Wings with Green Peas and Carrots recipe), today I am going to tell you another one. After my husband and I were married, we decided that my parents and his parents should meet in person. So all four of us (his parents, my husband, and I) went on a 2-week trip to Romania in February 8 years ago. It seems that we can’t go to Romania without funny things happening to us (like this story here: Vegetable Borscht recipe), and this time was no exception. One day all six of us (my parents too) went to see the ruins of a beautiful castle in the Transylvania region. We enjoyed walking around and exploring for a few hours. When we decided to go back to our hotel, the night had already arrived (it was February and the days were shorter) and a crisp chill was in the air. But the gates of the castle were closed. Yes, closed. As in “What are we going to do now? !” closed. Nobody had checked to see if there were people (us) inside the castle before they decided to close the castle and the outer gate. What to do? We had no cell phone with us and we knew that the area around the castle was quite deserted; yelling would have not helped us in any way. Or maybe we would have attracted some vampires that, as the legend says, seem to live in Romania. Who knows, we did not try yelling, so I guess we will never know if they would have been interested in us or not. The locked gate was in a tall brick wall that was surrounding the ruined castle. Our only option was to climb over the wall. We ended up walking by the wall until we reached a house that was sharing a part of the wall with the castle. Eventually, a man who lived in the house heard us and brought out two ladders – one to climb up the fence and the other one to climb down inside his yard. After a short conversation which I translated both ways, we walked back to the hotel. We had a good laugh after and we fondly remember this time we spent in Romania together. 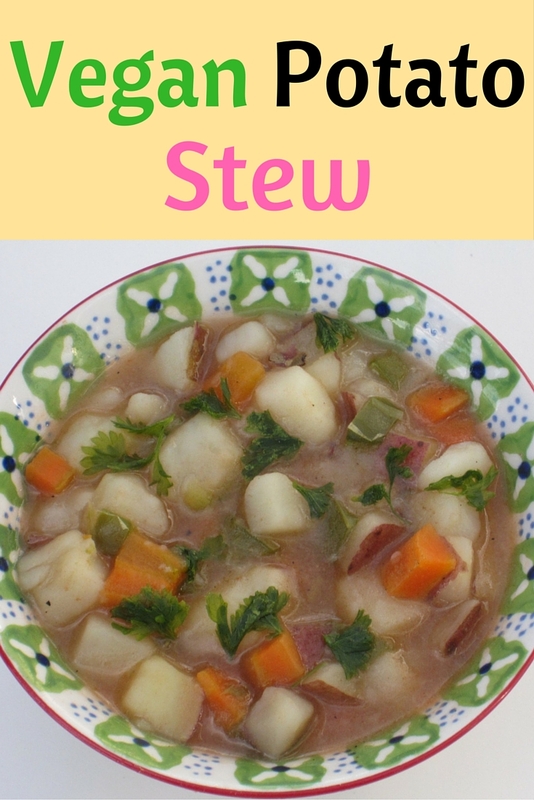 So how does the Potato Stew fit in my story? It does a bit, because it’s a Romanian dish and the story happened in Romania 😉 . OK, now back to this delicious Romanian meal. The Potato Stew is a vegan dish, but if you want to add some protein, there are instructions at the end of the recipe on how to do this. Sauté the onion in coconut oil over low heat for 10 minutes, stirring occasionally, until the onion becomes translucent. Add potatoes, carrots, green pepper, water, bay leaves, black pepper, and sea salt. Bring everything to a boil and simmer for 10 minutes. Add the crushed tomatoes and simmer 10-20 more minutes until all the vegetables are tender. If you want to add some meat to this dish, brown separately 1 lb ground meat (any meat works) in 2 tablespoons of coconut oil. When there is no more pink left, mix the meat with the cooked stew. Sprinkle parsley on top prior serving. Do you have a funny story from your travels?